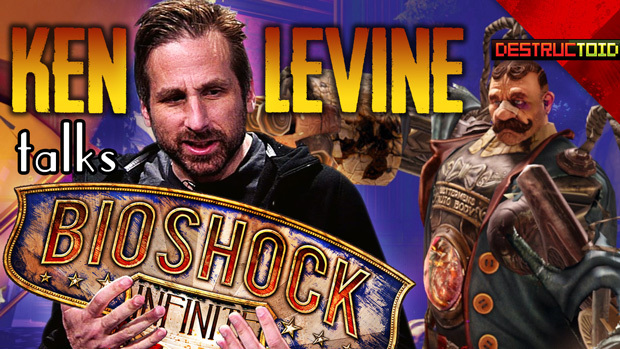 With BioShock Infinite mere days away from release, I sat down with Irrational Games' Ken Levine this week to discuss exactly how the game has changed over the past five years of development, and what he envisions for the future of the series. I was particularly curious to know how, after last year's reports of a cancelled multiplayer mode, Levine felt about the idea of narrative-focused games adding multiplayer, and whether or not it cheapens the experience. "I was the first guy who said, 'Look, let's try [multiplayer]' ... but it was tough, because it had to be something unique to us," said Levine. "The first game we made that didn't have multiplayer was BioShock, and it was by far our most successful game. And so, I think the last thing we wanna do is throw this thing in the box just so we can put a bullet point." The mode was eventually nixed due to a lack of proper time and resources, but that didn't stop vitriol from spewing out of every corner of the internet. Comments like "Good riddance" and "nothing of value was lost" were littered in the comments section of every article, and Levine - a lifelong gamer himself - seems to bear an understanding of where it all came from. "People, especially I think with the BioShock games, they have this sort of emotional connection to things," he said. "I think that's where you see some of the various scandals and outrages... because people feel an attachment to it. And if you don't respect that attachment, you reap the whirlwind." I wouldn't be the first person to denounce the recent trend of tacked-on multiplayer modes (BioShock 2 and Tomb Raider both come to mind), but when developers begin to feel as though they have to include one, for no other sake than simply adding something new, it doesn't instill a whole lot of confidence in their game. Thankfully, based on what I've seen of Infinite so far, I think it'll manage just fine without. Look for our review next Monday.